VATICAN CITY (CNS) — Christians must allow the mystery of God’s mercy to enter into their lives, which are inevitably marked by sin, Pope Francis said. 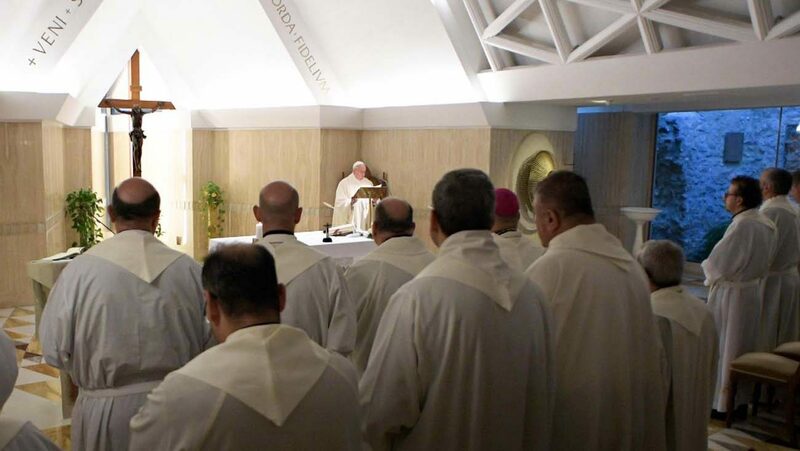 As each person follows God’s call, “there will be sins, there will be disobedience, but before this disobedience, there is always mercy,” because God is always faithful and never rescinds his gifts, his call and his promise of salvation, the pope said in his homily at Mass in the Domus Sanctae Marthae Nov. 6. The apostle doesn’t try to explain this mystery of God’s mercy, but rather offers thanks and praise for God’s faithfulness, he said. “Each one of us has been chosen” by God and, like Abraham, “each one of us holds a promise that the Lord has made, ‘Walk in my presence, be blameless,'” and God will establish his covenant, the pope said. People must ask themselves whether they are as faithful to that covenant as God is, he said. Do people even ponder the depth of God’s fidelity by letting themselves feel God’s caresses, his care and attention, and his “seeking us out” when they stray? He asked that people also reflect on how they keep God’s covenant and let themselves — their sins and disobedience — be touched by God’s mercy.